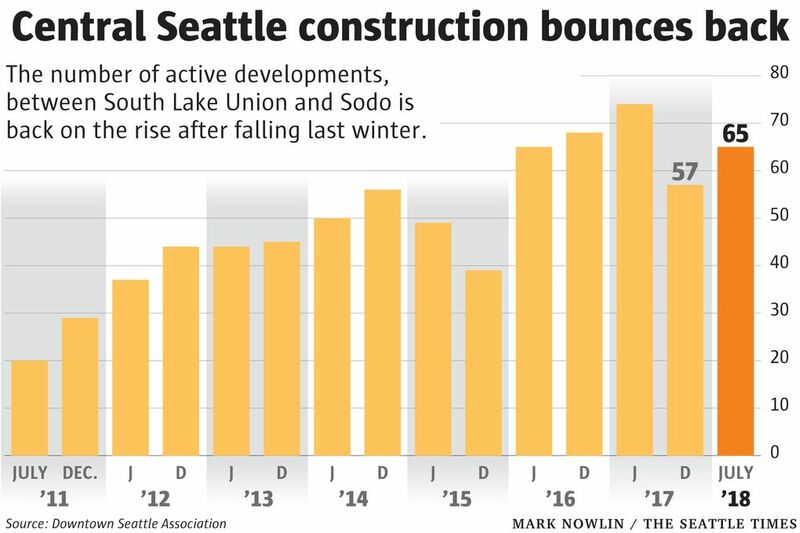 Housing and office construction is up from the historical average but behind recent peaks across the region that stretches from South Lake Union to Sodo. The number of construction crews remaking Central Seattle has picked back up in recent months but remains behind peak levels seen a year ago, when office construction topped the nation among all U.S. downtowns. The Downtown Seattle Association uses city permit data to tally up construction totals each winter and summer for the region that spans from South Lake Union to Sodo, where the majority of Seattle’s development takes place. The most eye-popping number from the report? 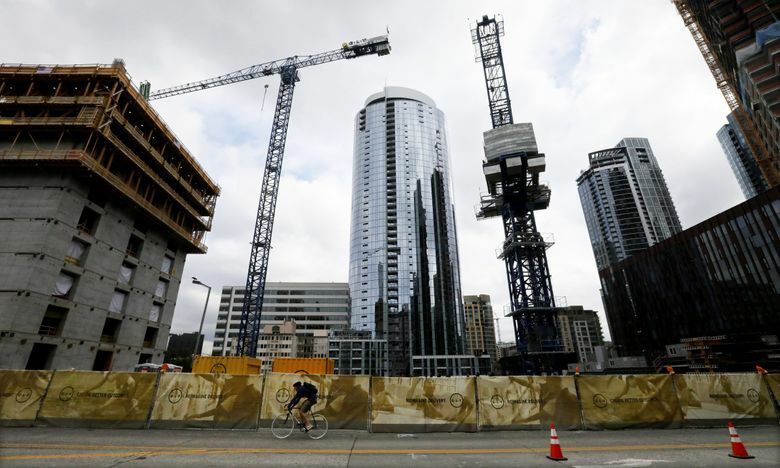 Last year, among central business districts, Seattle led the nation in office construction completed, accounting for 20 percent of all office projects finished in major U.S. downtowns, the group said, citing research from the commercial real estate firm JLL. Amazon is the main reason – the tech giant continues to dominate the Seattle office market and now has 10 million square feet of space in the city, or about one-fifth of the Class A office space citywide. But new office towers for Facebook, Google, F5 and other companies also have bolstered commercial real estate activity. Still, most of the construction continues to be apartments for those tech workers and others. About 60 percent of all projects underway in the greater downtown area include housing, and virtually all of those are rental apartments. That’s helped rents flat-line in the past year or so. Apartment and office construction is lagging behind recent peaks, however. Central Seattle had 8,880 housing units underway at this point last year but 6,880 now. And the greater downtown area has 6.5 million square feet of office getting built now, compared to 7.1 million square feet in 2015. The construction boom just from this cycle has completely transformed the downtown area. Compared to 2010, the area’s housing stock has surged 56 percent while office space has grown 19 percent. The one sector that is peaking now? Hotels. A record 2,192 rooms are set to open this year, and half of those are in the Hyatt Regency, which is slated to be the region’s biggest hotel. South Lake Union continues to change the most. Of projects underway now in Central Seattle, 22 percent are in South Lake Union. Another 18 percent are in First Hill, 11 percent are in the Denny Triangle and 11 percent in Lower Queen Anne. The neighborhoods with the fewest projects are the International District, the retail core, Belltown, Pioneer Square, and along the central waterfront. The biggest project, by estimated cost, is the $600 million first phase of Expedia’s new campus, followed closely by the $570 million Rainier Square redevelopment, which includes an Amazon office and luxury apartments. The pipeline of possible future projects continues to be large and hasn’t changed much recently.  A total of 34 new projects are ready to go soon, either with permits issued or in early demolition stages. An additional 125 developments are in earlier planning stages, though not all of those will get approved or built. The report also compares Seattle to San Francisco, which the downtown association calls “our sister city.” Both West Coast hubs are grappling with thriving tech economies and sky-high housing prices. On the one hand, Seattle has built 62,000 housing units since 2006, twice the number San Francisco built. And since 2000, population density has grown 22 percent in Seattle, compared to 12 percent in San Francisco. But The City by the Bay remains more than twice as dense as the Emerald City.